As companies adopt new enterprise architecture options such as hyperconverged storage to improve performance and simplify deployments, over time there is a need to expand the workloads. However, challenges arise due to not having file based storage services. Nexenta enables hyperconverged storage to flourish with simplicity to help grow your businesses by providing complementary NAS and hybrid public cloud capabilities. 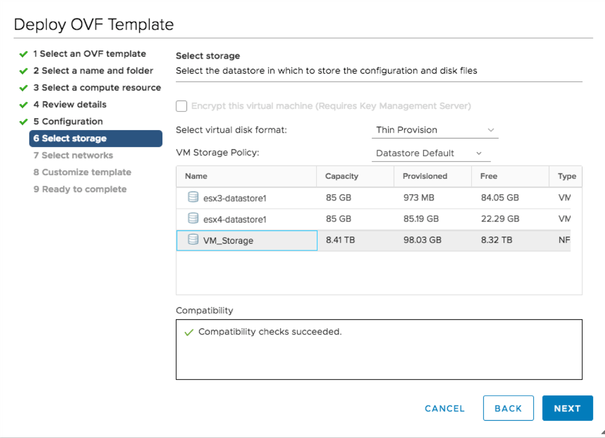 Hyperconverged storage, public cloud platforms like AWS, and standard servers connected to SANs are all excellent options for hosting virtual machines (VMs). Most of these are forms of software-defined storage enabling commodity servers and SSD/HDD media to perform advanced storage functions, but they are not built to deliver file services. Adding file services can increase the versatility of these storage systems to address user directories, virtual desktops, and back-up applications. Fortunately there’s a way to add file services to the hyperconverged solution using another form of software-defined storage via Nexenta’s award winning fifth generation storage software, NexentaStor. 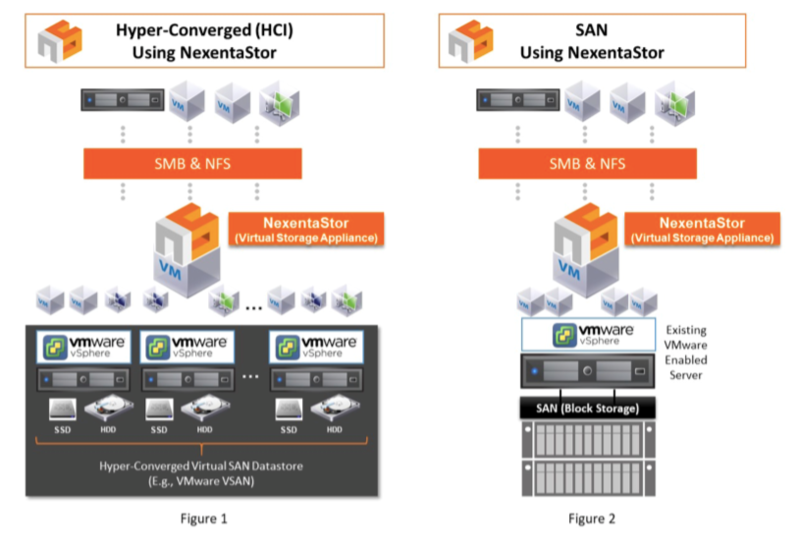 This highly efficient, hardware-independent option runs as a VM on an existing hyperconverged node (figure 1) or on a VMware enabled server to form a “Virtual Storage Appliance (VSA)” (NexentaStor VSA). By using the capacity presented to NexentaStor as a VMDK (Virtual Machine Disk), we can create a full featured NAS for delivering NFS or SMB/CIFS shares and even iSCSI LUNs. A VM hosting NexentaStor VSA provides all of the NAS capabilities while consuming very little overhead from the server/node. To make deployment simpler and faster for users, we have packaged NexentaStor VSA as an OVF appliance. The NexentaStor VSA OVF is installed directly from a single URL for the OVF (https://prodpkg.nexenta.com/nstor/5.1.2.0/addons/NexentaStor-VSA.ovf).To deploy the NexentaStor Virtual Storage Appliance you simply choose Deploy OVF from the vCenter interface and enter the url. To simplify the solution even more we have customized the OVF, visit https://blog.nexenta.com/2018/07/17/file-services-for-hci-and-block-storage-simplified/. The combination of existing servers, storage, and NexentaStor VSA provides a versatile NAS and Hyperconverged solution without incremental hardware enabling these systems to broaden the use cases available via file services. The NexentaStor VSA option integrates cleanly with VMware’s vCenter console for a simplified and unified management experience without any changes to the existing hyperconverged storage systems. Read more about adding NAS capabilities and delivering full-featured enterprise file services to hyperconverged storage by visiting our NexentaStor VSA page.